When a small business owner asks, “where should I start with SEO”, several answers come to mind. I tend to cast my vote in favour of local SEO — mainly because local search results can often be boosted faster and more cost-effectively, and they are also a nice stepping stone for any future SEO work. Without feeling the need to throw a bunch of local SEO stats your way, let’s just dive straight into the tips. And now for the tips! Although we can’t exactly prove this will significantly impact your rankings (or in fact impact them at all), there is evidence to suggest that Google will use the address the domain is registered at as a way to rank it in local search results. In other words, if you can, use your business address when registering the domain name. Try to use your business name as the domain name. Unless there are already businesses with the same or similar name ranking for it, you should climb to the top of results pages for at least one keyword easily enough. The more technical aspects of your website play a significant ranking role as well, even if you are not aware of it. How fast your pages load, how fast your images load, how long does it take to start a video — all of this will impact how high up on the ladder you find yourself, but more importantly, it can drive users away if they don’t have the patience to wait for your host. Which will yet again hurt your rankings. But apart from the now obvious “find a fast and reliable host with decent uptime”, you should also consider finding a host in the area you want to rank in. For example, if you want to branch out and target a US-based audience, and your host is still in Dublin, you will have a more difficult time of it. Find a reliable and location-specific host if you can — and choose a local TLD. The first thing everyone talks about when local SEO comes up is getting listed on Google My Business. Your GMB listing is what will show up in search results and on Google Maps — so make the most of it. Add as much detail to your profile as you can — including descriptions, services, offers and photos. It might seem like a bit of a snoozefest (as creating any directory listing undoubtedly is), but your listing and the attention you pay it sends a signal to Google that you are a real business and that you care about attracting customers. Try to mention your main service offer in the business title — this can have a huge effect. Also, this is where you will be collecting reviews from past customers, but more on that in a bit. 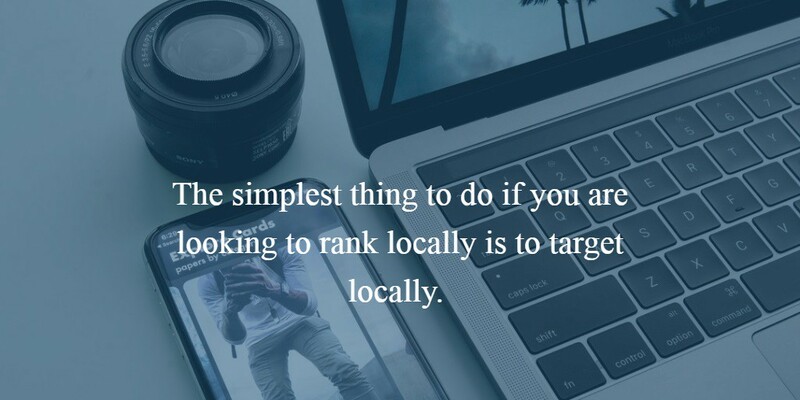 The simplest thing to do if you are looking to rank locally is to target locally. What this translates to in real-life is choosing your keywords based on the area you operate in. For example, if you are an electrician who works in Ringsend, Poolbeg, Sandymount, Ballsbridge and Donnybrook, you will be aiming to add these location-specific keywords to your more general electrician keyword. Of course, you can also add Dublin in. Not only can you, you should. You will be competing for the top spot for these specific keywords only with fellow electricians who both work in the same area, and are also trying their hand at SEO. A much less crowded battlefield than the one surrounding electrician, or even electrician Dublin alone. On another plus side, location modifiers increase conversion rates, as they instantly and clearly denote where you can be found. Add to that your working hours or even prices, and conversions should increase even more. Apart from targeting local keywords, you should also target long tail ones. While it is true that local competition is often less difficult to overcome than the global one, targeting specific long tail phrases can give you an additional edge. Let’s say we are trying to rank a local plumber’s website. Imagine he offers emergency services 24/7, and can fix your leaky tap, your burst pipe, clogged toilet and can also work on your faulty radiator. Trying to rank for keywords like emergency plumbing services Dublin, 24 hour plumber in Dublin, fix leaky tap Dublin on a Sunday, burst pipe emergency Dublin, will often yield better results than just the main keyword + location combo. You don’t have to worry too much about optimising your page for all of these different keywords. Most pages rank for multiple keywords whether you mean them to or not. All you have to do is detail your services and expertise on the appropriate pages, and see how they perform. After a couple of months, you will be able to analyse which queries have brought in your most converting traffic, and re-optimise accordingly. Even though they are not as important as they used to be (at a time when SEO was quite a different ballgame), keywords are one of the stronger signals search engines use to rank you. If you operate at a single location, and are targeting a single area, your website should be optimized for that specific location. Let’s say you run an accounting practice in Galway. To rank better locally, you will need to add Galway to all the keywords you would use to rank globally: accountant, accounting practice, tax accountant, etc. If you have several locations, you will need to create a separate landing page for each. You can (and should) list all of your locations on your home page. But don’t create a page for company registration services and try to rank it for multiple locations, shovelling on data about both Galway and Limerick. Other than that, the process is quite the same. Don’t overdo it though. Keyword stuffing is very out of date, and writing pages for users instead of search engine robots is the new norm. 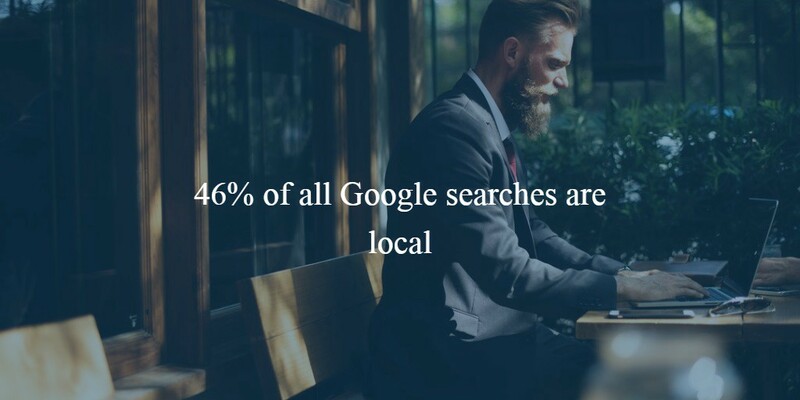 As I’ve already said, 46% of all Google searches are local. And most of them come from a mobile device. Having that fact in mind, it is quite clear why your website needs to be easily and readily accessible from all devices. Depending on the industry you are actually in, people may not look for you from a mobile phone because they want to stop by. Take our infamous plumber again. Chances are people don’t actually want to come by and have a chat. But, as mobile searches have surpassed desktop searches a while back, you can safely assume that some of your clients will take to their phones to solve their plumbing emergency. On the other, more notable hand, if you are a restaurant, a shop, a hairdresser — chances are people will use the “near me” feature to find you. Which is where your NAP and My Business listing come in handy once again. Other than that, making sure your website is responsive is a clear given. And that means more than just adapting to a screen size. Your menus, images and fonts also need to be clearly readable on any screen, at any orientation. Text is not the only thing you will be looking to optimise. Image and video searches are also an important factor to consider when offering local services. Especially if you can showcase some of the work you have already done in the area. When adding images to your website, make sure you add your location to the ALT tag of each image, and if applicable, note where the image was taken in your image title or description. The same goes for video — make sure to add your local keywords to descriptions and titles if it seems appropriate and if a local audience might specifically be interested in it. Getting your customers and clients to leave reviews is not only going to help rankings — it will influence the way people perceive your company. Reviews usually naturally contain the keywords you are looking to rank for, and which are also used by fellow searchers. And while they can certainly be faked, and there are even those who leave malicious bad reviews having never had contact with your company, encouraging people to share their experience should be on your task list at all times. You can do this by simply adding the option to leave a review at the bottom of newsletters or confirmation emails, and you can also set up a gentle CTA on your website for people to share their thoughts and help others discover you. Don’t forget to reply to every review — good or bad, fake or real. This is more important from a customer-centric than a search engine perspective. Just taking the time to thank customers for sharing their views will go a long way. Directories may be considered low level links, and may at times bring in zero traffic, but they can nevertheless significantly impact your local rankings. No matter where your business operates, chances are you can uncover lots of free local directories. Start with niche specific directories: if you are a plumber, look for directories that list plumbers in your local area, then spread your net wider, as wide as your country of residence if need be. Then look for less specific ones, like home improvement directories. There will be lots of local NAP directories you should create a listing on like Yelp, Golden Pages, etc. Don’t forget places like your local Chamber of Commerce. When registering on any of these directories, make sure you use consistent NAP (name — address — phone number). If you have recently moved or changed your contact details, you should devote some time to checking your old listings and updating all the incorrect data. Another useful piece of advice: create a spreadsheet for your directories, listing any and all you find might be good to have. As you go about creating them, add in your chosen email and password for each, and any other relevant details you might need in the future (cost of listing, images used, etc.). This will save you a headache down the line when you realize you have no idea what that password you were sure you would never forget was. When I say local, I am referring to a slightly larger area than the one you offer your services in. After all, there are only so many websites registered in Ringsend. Aim to acquire links from .ie domains and websites that target the national market and very local. 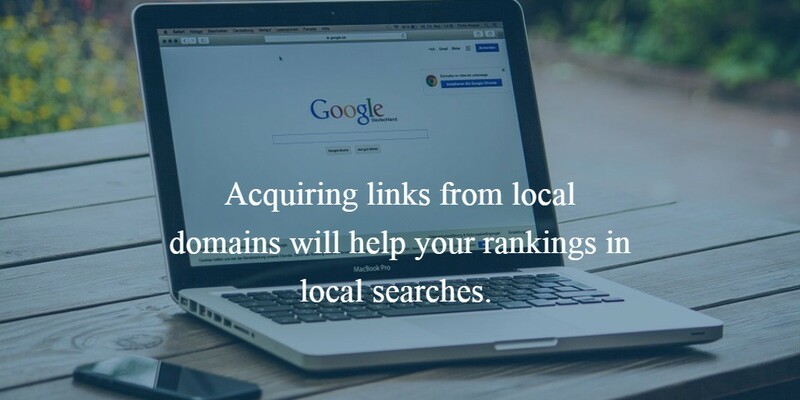 Acquiring links from local domains will help your rankings in local searches. They will also help your global rankings but to a much lesser extent. In fact, if you operate in Europe and are building a lot of US links, you might rank better there than at home. When it comes to the types of links you are looking to acquire, the main rule to govern your actions by is to only build links where it makes sense. These links can come from competing websites (if you can score them), local news portals and local blogs, the websites your competitors build links on, and so on. However, the main point is to only look for websites you would not mind being associated with. A very complex subject in itself, and one we will likely tackle in another post. For now, suffice to say that you should try to build as many local links as you can. When trying to attract local business, you don’t need to focus your content on global issues and large general pieces that might interest just about anyone looking for your types of services. As much as you can, try to incorporate local data into your content, and write it specifically for the locals you are trying to convert. The area you do business in must be unique in countless ways. Moving back to our plumber example, what do you know about local pipes, local issues and the most common emergency plumbing situations in your area? What is the weather like, does that influence the schedule of heating maintenance? Write from your own local perspective and experience as much as you can. You already possess a very wide range of information that can be useful to the people you are trying to reach. Use it to your advantage, instead of trying to emulate a global brand, or a company operating in your line of business, but in a different area. While social media does not actually influence rankings (or does it? ), being active on a few select channels will help you get in touch with your target audience. What this means most of all is trying to share wisdom and help the community out. Share information that might be interesting to your local followers, get involved in local community efforts and actions and don’t just push your own message. Every community will have a hashtag on Instagram and Twitter or several notable groups on Facebook. Participate there, and only subtly push your agenda, if at all. Offer your services only when someone specifically asks for advice or a recommendation. Don’t be afraid to recommend other companies who are not your direct competitors, but who can solve a specific issue your audience might need solving. Social media is all about getting recognized and spreading awareness about the good work you do. But in order to do that, you need to treat it more as a vehicle of communication than a marketing tool. Finally, check out what other companies in your area are doing SEO and marketing wise. Where do they acquire local links from, how do they reach their audience, what directories have they used? You don’t need to stick to your direct competition alone either. Look at companies who market themselves to your desired audience, and take it from there. You can even partner up with some of them, and find a way to help each other out. Remember that you are not trying to simply steal someone else’s good work. You are looking for inspiration and tips (and potential link opportunities). Compile a list of companies to watch, and come back to them every so often, just to see where their links are coming from, and what new marketing tactic they have been using. If you have stuck with it this far, let me know below how you found my little primer on local SEO. Any other tips you would like to share? Any points that have still remained unclear? Let me know, and I’ll see you in the next one! And before we part ways, let me recommend myself as your local SEO expert. Cube Digital is proud to be running several very local campaigns as we speak. If you would like to find out how we can influence your rankings and bottom line, get in touch and let’s have a chat! Have you read why marketing managers hate SEO?